Reversing Shoulder Tendonitis is what you want to do if you have pain and other symptoms of Tendonitis of the Shoulder. We want a magic bullet, a quick fix, an effortless cure. Unfortunately, that's just not how the body works. That's certainly not how Tendonitis works. Tendonitis of the shoulder, just like Tendonitis anywhere else in the body, is a progressive dynamic of increasing muscle tightness, increasing connective tissue constriction, and an increasing Process of Inflammation. You have pain. You've tried other options and you still have pain. 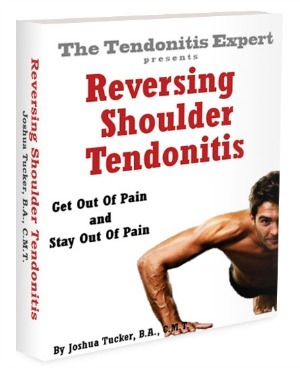 I created the 'Reversing Shoulder Tendonitis' program as a How To Guide to getting you OUT OF PAIN. Why Are You Still In Pain? If you're here, it's likely that you've already tried taking time off, resting, using ice packs, stretching and strengthening, anti-inflammatories, splints and braces, corticosteroid shots, and on and on and on. Maybe you've even had shoulder surgery. And you're still in pain. Some people just give up. Some people live with the pain and lose hope of it ever changing. But you're not in that category, are you? The good news is, for MOST people, Shoulder Tendonitis is a relatively simple thing to take care of. It does take some work and some diligence, but it's not a mystery once you know how to do it. "I wanted to thank you for your help. I have Tendonitis, bursitis in both shoulders & adhesive capsulitis in my right shoulder for years. I re injured my right shoulder very badly about 7 weeks ago. I have had coritsone injected with an ultrasound guiding it. I have been through physical therapy several times & they made everything worse. I have had 4 vertebrae fused together in my neck & I have Tendonitis down both arms & hands. No one & nothing has helped me. This last 7 weeks I have been in unrelenting pain from my right shoulder & arm. The orthopedist said that there is nothing else that they can do. I found your website & bought your program. I am 63 years old. I have only been able to do this twice per day but it is helping. Your program (even modified) has helped me when nothing else has. Again, thank you & keep doing what you do. If it can help me it can help anybody." How Do You Get Rid Of Shoulder Tendonitis? Shoulder Tendonitis is a PROGRESSIVE dynamic of increasing tightness, constriction, inflammation, and pain. Rest and splints and corticosteroid shots and all the rest didn't work for you because they didn't target all the factors that go into your pain dynamic. You have Shoulder Tendonitis due to several physiological factors. Each one must be successfully dealt with for your pain to go away and stay away. You can REVERSE the progressive dynamic by decreasing each negative factor, and that gets your structures back to working happily and healthily again. Following the protocol in the 'Reversing Shoulder Tendonitis' program is the way to 'fix' your shoulder pain. Immobilizing and resting your shoulder will not work like you want it to. That's just not how the body works. Surgery might work, but how does surgery reverse a dynamic of tightness, connective tissue constriction, nutritional insufficiency, and inflammatory reaction to pain? At best surgery can just repair a rip/tear injury. And did you know that you can have Tendonitis pain without any actual damage? How will surgery fix that? I'm not much at writing sales copy, but here's why you may want to consider purchasing the 'Reversing Shoulder Tendonitis' program. If you follow the plan in the ebook, it WILL work. You're going to learn an incredibly valuable lifelong tool you can use to keep yourself out of pain (whether it's the shoulder or elsewhere, the concepts are the same). 1. It contains ONLY what you need to know to get yourself out of pain. With the ebook being 58 pages, there is no fluff, no filler, no long thesis. There is concise explanation and instruction that you can go through quickly so you can get started getting yourself out of pain. Some products out there are a package of 6 dvds and a thick instruction manual and workbooks and audio recordings, etc. That's great if that's what you're looking for, but this product is for people that want a get-to-the-point walk-through showing you how to reverse your Shoulder Tendonitis symptoms. 2. The methods in the ebook work IF you do them. The activities in the ebook are the most powerful, effective methods of getting rid of the negative qualities that are causing your Tendonitis problems, especially when used together. You've tried the usual methods already, and they didn't work. That's because they weren't the RIGHT tools, and they just dealt with your symptoms, not the cause of the problem. What you get with the 'Reversing Shoulder Tendonitis' program now affects the SOURCE of your pain and problem. 3. Right now the price is only $29.97! What is it worth to you to have your pain levels lowered, to have use of your hand back, to not have to worry about causing 'more damage' to yourself? I could charge more, the information in the book is certainly worth more than twenty bucks, and if I can help a lot of people get better at this price, then that totally works for me. I spoke this week with a woman that spent $1,000 on twenty sessions of acupuncture and got no relief. This program will normally be priced at $39.97. That's a great deal. And now you can save $10! You could have the program in front of you in the next ten minutes, and by the end of the day you could be taking actions that will actually have you feeling better. No shipping and handling to pay, and no wait. 5. NEW! Email Support Series. From day one you'll get a regular series of program support emails. 6. Diligence But Not A Lot OF Effort. Who wants to work hard to get out of pain? I don't. The self-treatment program is NOT a lot of work. Not even 20 minutes a day (though more can certainly be better). But like I said, we all want a magic pill and an effortless fix. I sure do! The problem is, Shoulder Tendonitis just doesn't work that way. There is no magic pill or miracle drug that will fix your shoulder. Any product that offers an effortless cure is INCREDIBLY unlikely to beneficially affect the CAUSE of your Shoulder Tendonitis dynamic. Perhaps you won't buy this ebook because you don't like the idea of having to put some work into it. That's fine, there's no reason to buy it and then not do the activities, so you just saved yourself $20. Of course, you'll spend a lot more than that down the road on other options. How much time, effort, and money have you already spent? And did any of it have a money back guarantee? You get a 6 month, no questions asked money back guarantee with the purchase of this ebook. My website is here to stay. I'll be here 6 months from now and 12 months from now and years from now. You have nothing to lose, and I want to help feel better and finally get back to your work and your play. "I actually put bowls on the top shelf this morning WITHOUT shoulder pain! Your techniques, guidance, and encouraging & helpful e-mails are magnificent. Get the 'Reversing Shoulder Tendonitis' program now! Secure Transaction. Money Back Guarantee! ** NOW INCLUDED: 4 week email support series with reminders, progress FAQ, and expansion of treatment specifics.